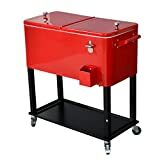 At your next gathering, chill down and serve up the beer and sodas in style using this retro, yet cool new Red Drink Cooler. 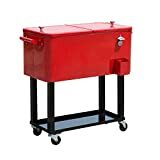 This insulated heavy gauge steel drink cooler features a red powdercoat finish, wheels to roll it closer to the party, a handy bottle opener and cap catcher on the side (someone always walks off with the bottle opener), and additional storage on the bottom. Great design as far as drink coolers go.